PLAINVILLE — Some danced down the carpet, high-fiving their way toward the beckoning slot machines. Others walked straight ahead. They were the gamblers and dreamers who thronged to the Plainridge Park Casino to share in a moment in Massachusetts history. The era of legal, Las Vegas-style gaming dawned in the state Wednesday, and within an hour after opening, throngs swarmed into every corner of the gleaming new slot parlor and set all 1,250 machines ringing at once. “This is what it feels like to be a celebrity,” said Ed Beauregard, a 74-year-old retiree from Northbridge, after he and his wife, Nancy, were cheered by casino employees on their way in. Many more chose to skip a sunny summer day to gamble indoors, and within three hours of the opening, the casino had hit its fire department-imposed capacity of 3,750 people. Patrons said they waited about 15 minutes to get in. Some cashiers had to close temporarily because they had run out of money. 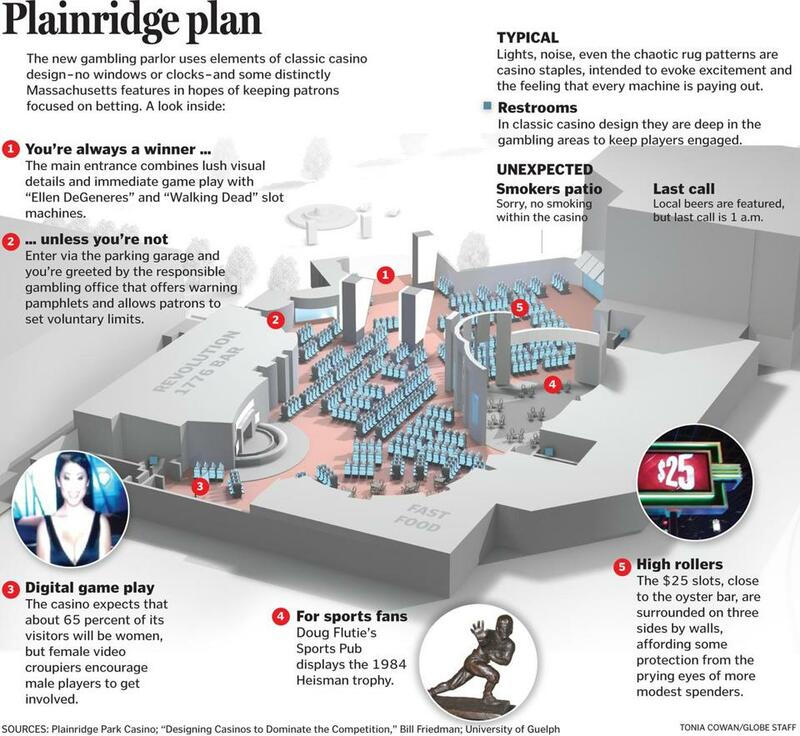 The sensational turnout was a welcome sign for Plainridge, which is projected to direct as much as $250 million in revenue to the state in its first two years. To do that, the parlor needs to make nearly twice as much money on each of its 1,500 slot and video blackjack machines as its Connecticut competitors, Foxwoods and Mohegan Sun. One of the driving forces behind Massachusetts becoming the 40th state in the country to allow casinos is the hundreds of millions of dollars in tax revenues that state residents have left behind in casinos in Connecticut and Rhode Island. Dave Reilly, 66, who arrived from Lowell with his wife Linda, is just the kind of guy Plainridge is looking for. Reilly said he would rather gamble — and lose his money — in his home state rather than taking the couple’s usual trips to Twin River in Rhode Island. “Good thing,” added his wife. Reilly was also one of those who struggled to find a place to play in the afternoon, when crowds briefly tested Plainridge’s ability to serve them as long lines formed at the food court, the cash-out machines, and some bathrooms. Plainville Police Chief Jim Alfred said traffic on Route 1 outside the casino was backed up for about a half-mile in both directions and on the exit ramps from Interstate 495 to Route 1. “We assume it’s going to be like this through the weekend,” he said. The parlor’s managers focused on the bigger picture. “It’s been a fabulous success,” said Lance George, the facility’s general manager. He said he expected to exceed his goal of 10,000 people in the first 12 hours of operation. “A lot of us have put a lot of work in getting this place ready,” said Ray Fuller, a purchasing manager who came upstairs from his office cubicle to witness history. “We are proud and happy for all this,” he said. In a state that traces its history to Puritan settlers who practiced a faith that looked askance at worldly pleasures, Plainridge represents a stark cultural break. As hundreds gambled, show girls in elaborate costumes and feathered headwear frolicked and the drinks flowed freely. Flutie runs a restaurant in the parlor, and his 1984 Heisman Trophy stands in the center of the casino, greeting bettors as they walk in. The 2011 state casino law passed after years of debate, pushed by then-Governor Deval Patrick as a source of revenue — forecast to be as much as $400 million a year when two bigger, resort-style casinos come on line in 2018. Patrick also considered it a jobs bill, expected to put 10,000 people to work. House Speaker Robert DeLeo threw his support behind the bill after a healthy share of casino revenue was dedicated to supporting horse racing in the state. Plainridge is owned by Penn National, one of the country’s top casino companies, which has sunk $100 million into the project. Judging by license plates on the cars in the parking garage, Plainridge on its first day not only kept Massachusetts gamblers home, it also attracted a sizeable contingent from Rhode Island and a smattering of folks from Maine, New Hampshire, and New York. Mary Carlozzi, 60, of New Bedford, could barely contain her excitement as she arrived at the casino with two daughters, one of whom is about to be married. “We are here to win money for her wedding,” Carlozzi said with a laugh. The Carlozzis make family reunions out of their casino outings. “My three sisters wanted to come, too, but they had to take a rain check until they have more money,” Carlozzi said, still laughing. By early evening, some of the novelty was wearing off. Carol Caranci, 74, of North Providence, R.I., said she was concentrating so intensely on playing the slot machines that she was barely aware of her surroundings. “I’m up about $30,” she said, before dropping her head back down to play. 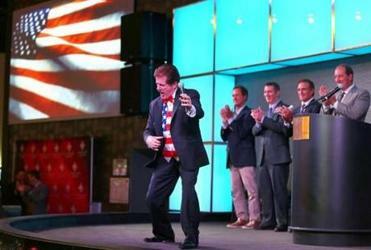 Rene Rancourt sang the National Anthem and pumped up the crowd with his antics.